Every year the DOE issues a Progress Report that grades schools on an A to F range. This year, BSGE has received a B for the middle school and an A for the high school. The school as a whole received a B last year as well. For both types of progress reports, the DOE grades the school in three categories, which include Student Progress, Student Performance, and School Environment. The high school is also graded on Career and College Readiness. In the middle school report card, Student Progress and Student Performance are dependent on the student’s grades in the Math and English state tests. In comparison, the same categories for the high school progress report are dependent on the numbers of students graduating, as well as their performance on the Regents exams. School Environment is based on the same criteria for both types. The DOE also awards extra points for Closing the Achievement Gap, which involves exceptional performance from students with disabilities and those who are English Language Learners. The points awarded in these categories are added up to get the letter grade. The middle school received a B, but this section of the school has fewer points than the high school does. The middle school has 22.4 points for Student Progress, which gives them a grade of C for that individual category. This suggests only that there was not much improvement in the grades of middle school students over the years, but that does not necessarily mean that these grades are low. Hypothetically, every middle school student could receive a 4 on their state tests each year, which would mean that the grade for Student Progress would be very low. The middle school has many points for Student Performance and half the points possible for School Environment. Only one point out of seventeen was awarded for Closing the Achievement Gap, as BSGE does not have many ESL and disabled students, so it was not possible for the school to achieve a high grade in that category. The total points awarded was 55.4, which translates to a B. The high school fared better than the middle school did, earning an A for the overall grade. 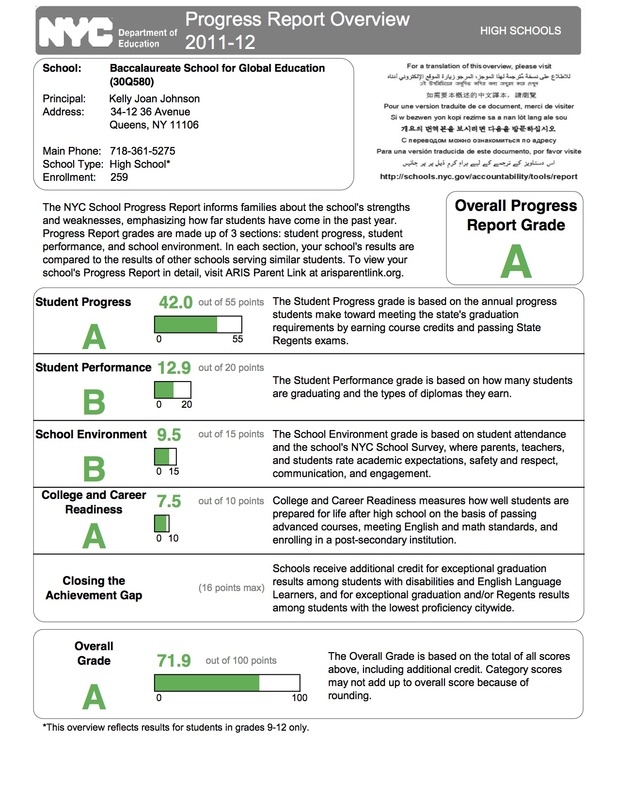 This portion of BSGE earned 42 out of 55 points for Student Progress, which translates to an A. This is judged using Regents tests and the number of students meeting graduation requirements, which explains the difference in score between the middle school and the high school. Strangely, the high school received a higher grade for School Environment, even though it is graded the same way for both schools. The high school earned a B for Student Performance, with 12.9 out of a possible 20. This was graded based on the number of students graduating and the types of diplomas earned. BSGE is known for its college readiness, as it is one of the reasons that the school is one of the top schools in the country. The DOE gave BSGE 7.5 points out of 10 for this criteria. The high school received no points for Closing the Achievement Gap. The total points awarded was 71.9 points, or an A. The DOE’s Progress Report does show schools what they need to improve on, to an extent. The system does have its flaws, especially as it uses the same rubric for all schools when not all schools are the same. There are extra factors that need to be considered. It is also one of the many evaluations of schools that can be accessed by students and parents. The DOE issues these progress reports, U.S. News and World Report and Newsweek both create lists of the best schools in the country, and forums like insideschools.org all offer praise and criticisms of schools. The Progress Report should not be the definite source for a school evaluation. Check out BSGE’s Progress Reports on the NYC DOE website.